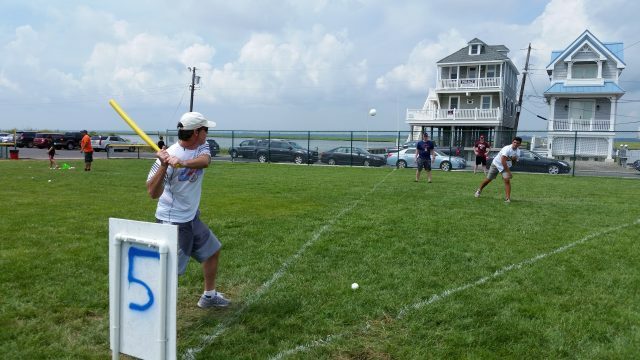 Players took their swings for a good cause during the Sea Isle City Wiffle Classic benefiting Autism Speaks. Statistically speaking, one out of every 59 children born in the United States will be diagnosed with autism. 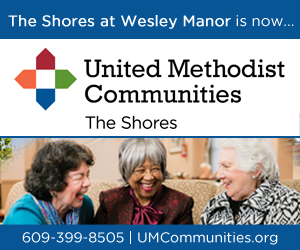 Brian Aylmer and his wife, Beth, have three of them – daughters Shannon, Cailey and Kelsey. Brian Aylmer noted that the medical world has not yet discovered what causes autism, although researchers strongly suspect a combination of environmental and genetic factors. In the meantime, the Aylmers, of Clayton, N.J., are determined to raise money to support autism-related causes and help researchers pinpoint the cause some day. For the past 10 years, they have organized a fundraising event called the Sea Isle City Wiffle Classic to benefit Autism Speaks, the nation’s largest autism advocacy group. Some of the 250 spectators and players came from as far away as Utah. 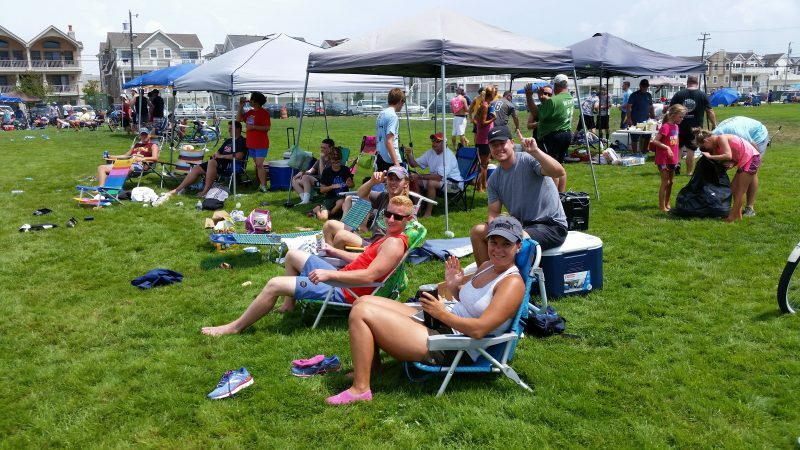 The event Saturday at Sea Isle’s Dealy Field attracted about 250 people from as far away as Indiana, Illinois, Michigan, Minnesota and Utah. Brian Aylmer said he hoped to raise around $10,000 for Autism Speaks. Involving 50 Wiffle Ball teams, the event is similar to a fundraiser that Aylmer first saw years ago in Minnesota, where he once lived. He was drawn to Sea Isle as the location for the autism fundraiser because his uncle, Joe Aylmer, lives in town. In the past 10 years, Brian Aylmer has watched the fundraiser grow from modest beginnings to an event that now sells out in July. Another measure of its success is the number of people who have returned year after year, he said. “The first year, they showed up with sippy cups. Now, they’re showing up with coffee cups. 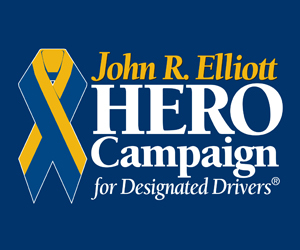 That shows you how they’ve grown up with us,” he said of some of the fundraiser’s participants. Brian Aylmer, of Clayton, N.J., the organizer of the event, has three daughters who are autistic. Aylmer said autism has become more prevalent in recent years, but doctors don’t know why. Statistics from the Centers for Disease Control and Prevention show that on average, one of every 59 births in the United States involves an autistic child, compared to one in 125 just 10 years ago. Autism is a general term for complex disorders of brain development. Depending on the severity of the disorder, autistic people may have difficulties with social interaction and communication. They may also engage in repetitive behavior. Aylmer explained that his autistic daughters Shannon, 12, Kelsey, 9, speak only a little, while 11-year-old Cailey is nonverbal, making communication difficult at times. “I believe that in the next few years, they will blossom and become verbal,” Aylmer said, maintaining optimism about the development of his daughters. Despite the challenges of having three autistic children, Aylmer stressed that his household is, in many ways, not all that different from other families. “I guess every day is different, just like with everyone else. There are good days and there are bad days,” he said. 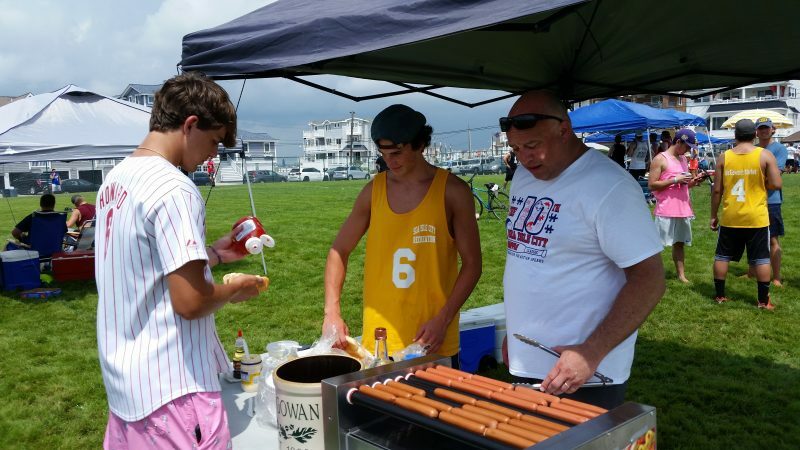 Sea Isle business owner John McGowan, right, and his 16-year-old son, J.P., in yellow shirt, serve up hotdogs. 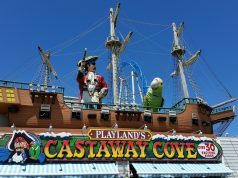 Sea Isle business owners John and Carol McGowan’s 13-year-old son, Owen, is a highly functioning autistic child who attends a regular middle school at the family’s home in Oreland, Pa., and does many of the same things as other teenagers, his family said. 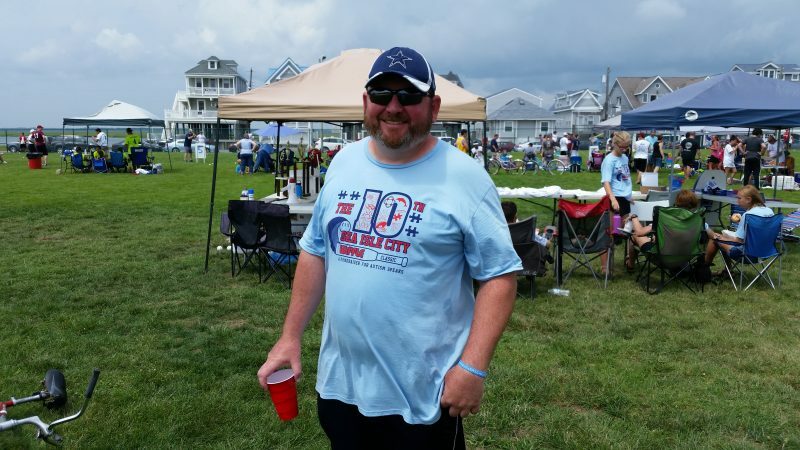 John McGowan said Owen has made everyone else in the family “better people” by getting them involved with autism-related causes and events like the one Saturday in Sea Isle. 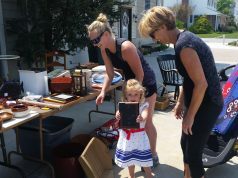 McGowan’s Market, located at 39th Street and Landis Avenue in Sea Isle, was one of the business sponsors of the fundraiser. McGowan’s gave away free hotdogs and donated a portion of its hoagie sales to Autism Speaks. Aylmer said the Sands Department Store at 62nd Street and Landis Avenue supported the fundraiser by donating prizes for the raffle, including beach toys and boogie boards. 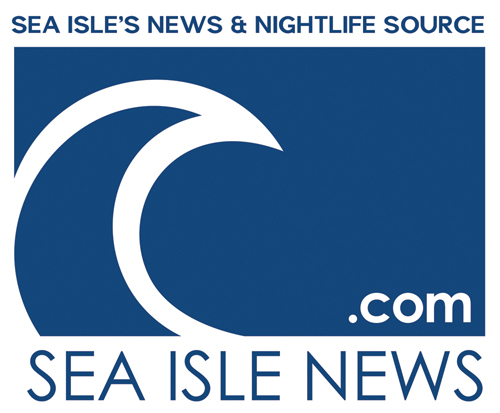 Sea Isle’s business community has made autism a special cause for years. For instance, Mike’s Seafood & Dock Restaurant on Park Road sponsors the annual Polar Bear Plunge Run-Walk for Autism, a major fundraiser. 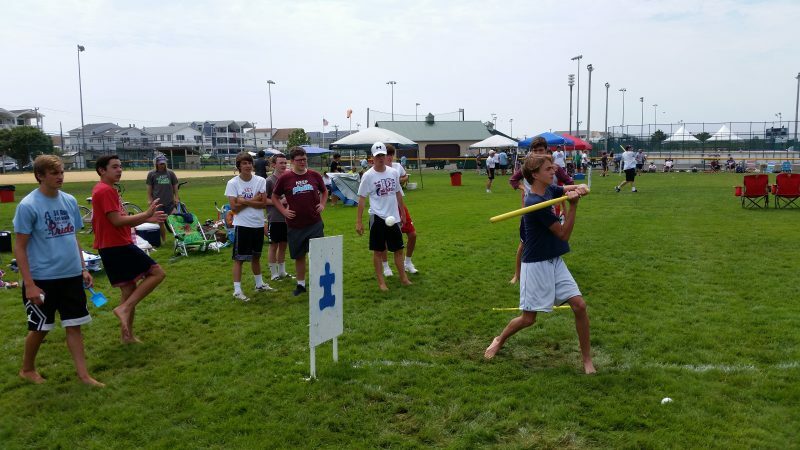 With 50 Wiffle Ball teams participating, the event was expected to raise about $10,000 for Autism Speaks.